I think in outlines. When I was in law school, that’s how I was taught to break down legal issues and structure the enormous amount of information I needed to know to pass exams. Outlines became second nature – something I still use today to organize research, write longer articles, and organize projects. I wish I had OmniOutliner when I was in law school. Those outlines grew as the semester wore on, adding complexity that made them harder to edit. Although the word processor I used could handle outlining, it wasn’t optimized for huge outlines the way OmniOutliner is. Today, my outlining needs are much simpler. I’m not creating 100-page outlines. If an outline is more than a few pages long, it’s only because it’s full of detailed notes. More often than not, all I need is a quick indented list, with simple formatting, and the ability to reorder sections easily. Perhaps the greatest strength of OmniOutliner 3 for iOS is that it can handle both scenarios. That’s because OmniOutliner 3 isn’t one app, it’s two: OmniOutliner Essentials and OmniOutliner Pro. Essentials includes all the tools you need for basic outlining, and Pro adds extensive customization options, section navigation, automation, and other features. Every year, The Omni Group reflects on the past year and provides a roadmap for coming year. 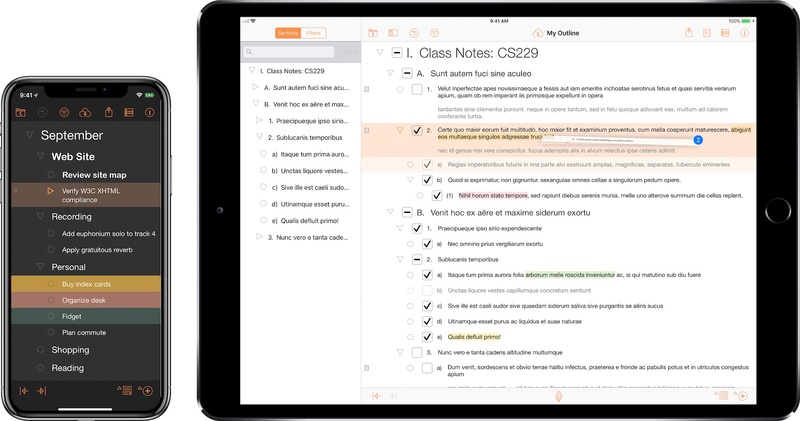 In 2018, OmniFocus will play a prominent role along with updates to OmniGraffle, OmniPlan, and OmniOutliner. OmniFocus for iOS has been around since the earliest days of the App Store. One of the biggest changes that will be debuted in OmniFocus 3 for iOS is the elimination of contexts, a Getting Things Done concept that hasn’t aged well. Contexts will be replaced with tags, which can be used like contexts or to indicate other attributes of a task like its priority, location, or time. With tags, Omni is will also introduce manual reordering of tasks within a tag. we turned to a design principle called progressive disclosure: we ask you to make simple decisions up front (like checking the option “does this repeat or not”), and as you proceed through the interface we progressively disclose more and more options based on what we already know about the task. Similar flexibility is being added to notifications, which will include more detail in each notification. OmniFocus is also adding the ability to add multiple custom notifications to single tasks and notifications that will continually badger you until a task is marked as complete, as can be done today in apps like Due. Omni has changes in store for its other apps too. The first 2018 update to OmniGraffle for Mac will focus on the Stencil Browser, which users will be able to place in the left-hand sidebar. A later update will add improvements to SVG import and export support. Later in the year, another update is planned to improve diagramming. OmniPlan for Mac will add a Project Summary Inspector that provides summary information about a project like its total cost and duration. OmniPlan Pro users will get a new timescale feature for customizing Dashboards too. Improvements to OmniPlan Pro’s publish and subscribe sync feature are planned for later in the year. It looks as though 2018 will be a busy year for Omni. 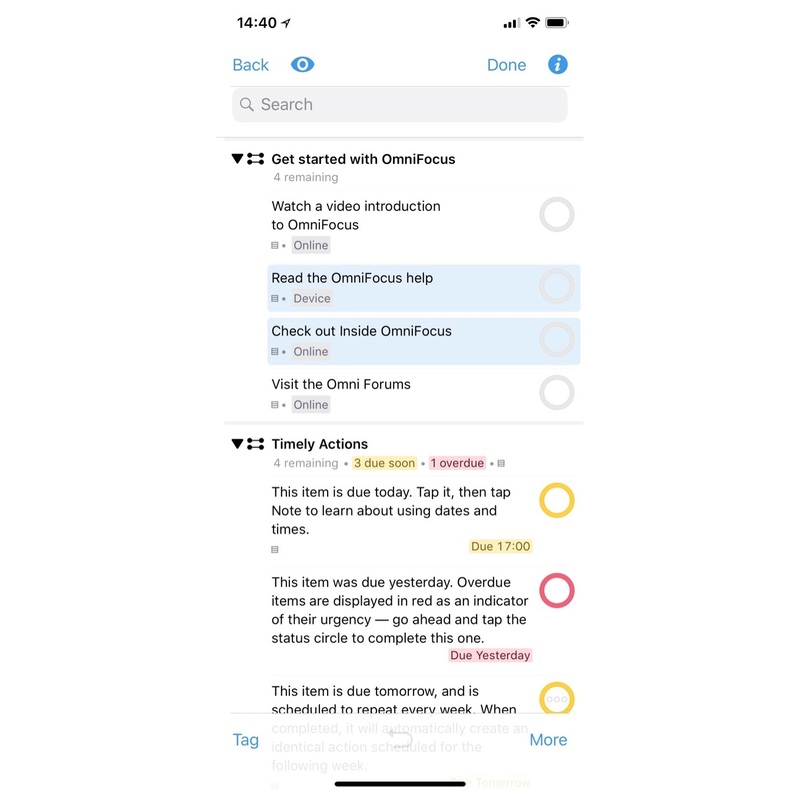 Updates to apps like Things have raised the bar on task management apps, so it’s good to see Omni rethinking and redesigning some of the fundamental aspects of OmniFocus. I’m also looking forward to the OmniOutliner, an app that I’ve used on and off since it was first introduced on iOS. Ken Case, CEO of the Omni Group, wrote today about a new detail of its upcoming OmniOutliner 5 software. 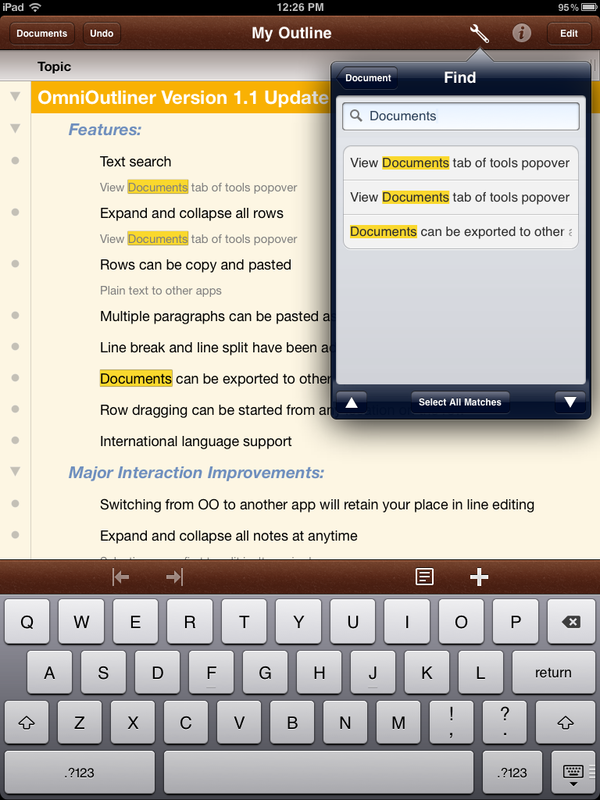 In addition to the traditional Pro version, OmniOutliner will also come in a new Essentials version. In OmniOutliner’s new Essentials edition, your entire focus is on your own content: there are no distracting sidebars or panels. You can choose to work in a window or in a distraction-free full-screen mode, selecting from a set of beautiful built-in themes. As you write, you’ll be able to see some key statistics about your content so you can track progress towards your goals. But our goal is to help you focus on your content and whatever task you’re working on—not on the tool you’re using. While Case's post references OmniOutliner for Mac specifically, he later confirmed in a tweet that OmniOutliner Essentials would be coming to iOS as well. P.S. — Yes, OmniOutliner Essentials will be coming to iOS (when we ship version 3 later this year). And yes, it supports document syncing. This announcement represents a shift in direction for the Omni Group. The company's traditional offerings have included Basic and Pro versions of each program, but the Basic version has historically not been anywhere near the price point of this upcoming Essentials edition. It will be interesting to see if this new approach expands to Omni's other apps over time. Today's news is the second major shift in pricing strategy the Omni Group has made in the past year. Last September saw news that they would begin offering software as free downloads in the App Store, with an In-App Purchase to unlock full functionality. This change in pricing model made it possible to offer free trials, such as with OmniGraffle 7; trials are currently not possible on the App Store under the paid up front model. 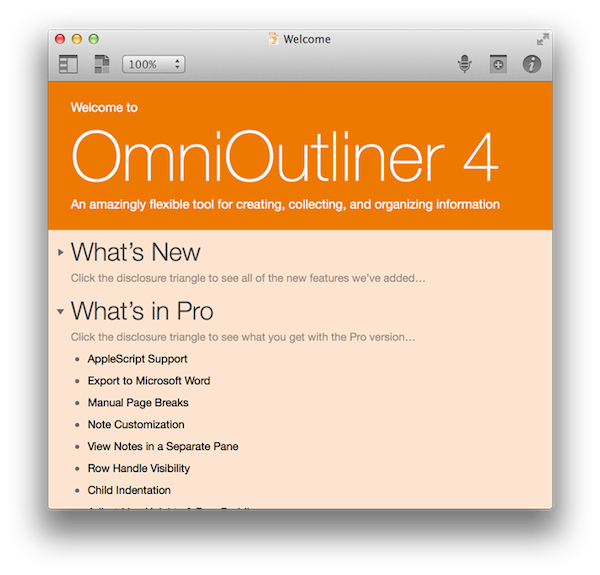 OmniOutliner 5 for Mac is currently in a public test that can be downloaded here. More information about the Essentials version is available here. It was just over a year ago that CEO Ken Case of The Omni Group outlined the company's plans for 2013, following a successful "iPad or Bust!" campaign that allowed the company to bring all five (well okay... "four") of their desktop productivity apps to the iPad. So it was back to the Mac as it were, with OmniFocus 2 being at the forefront of the company's plans with OmniOutliner 4 due afterwards in the first quarter. As an app that was first released in January, 2005, OmniOutliner 3 was in need of an update. As Ken Case said himself, "... other than a few tweaks to the inspectors and toolbars, its design has mostly stayed the same: it’s starting to feel a bit long in the tooth." 2013 came and went, and as they say, all good things take time. OmniOutliner 4 is a big update. For posterity, we'll call it Outliner for the rest of our overview. And honestly, I really don't know where to start. Announced in December 2012, The Omni Group has today started the public rollout of OmniPresence, their new free automatic document syncing solution for OS X and iOS. 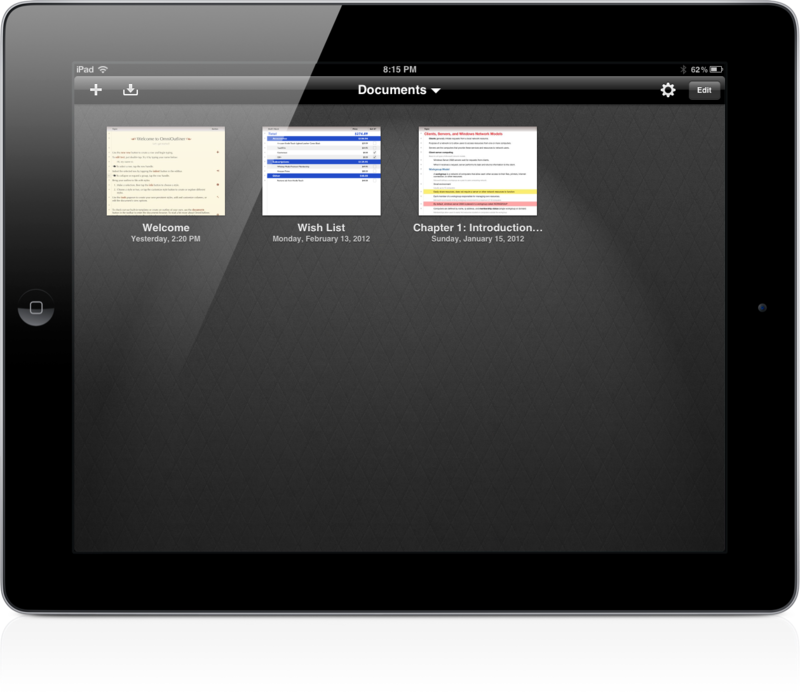 OmniPresence, based on open web technologies, is available inside OmniGraffle, OmniGraphSketcher, and OmniOutliner for iPad, and it also comes with a companion Mac app that runs in the menubar. A few months ago, I asked if there was a way to produce plain text-based outlines and import them into OmniOutliner for iPad while preserving indentation. Today, Jeff Hunsberger has posted a nice overview of his setup, which doesn't include OmniOutliner but relies upon the same "trick" I use -- speeding up plain text outlining using Nebulous Notes' macro functionality. Just by setting up those few macros, I have create a fully-realized meeting outline tool in markdown using Nebulous Notes. The outline in the same format I've been using for years and is searchable, extensible and ubiquitous thanks to Dropbox. The beauty of this is, after the meeting is over, the notes I've just taken are ready back at my desk -- they can be inserted into an email to the team with a simple copy/paste. My workflow is only slightly different. Firstly, I usually outline in CarbonFin Outliner on the iPad (Tree on the Mac), but sometimes good ideas strike when I'm already in my text editor, thus requiring me to write them down as quickly as possible. What I end up with is a rough structure of my thoughts that I want to further refine in OmniOutliner. From there, I'll then export as OPML to CarbonFin Outliner. It sounds convoluted -- maybe it is -- but this setup works for me. 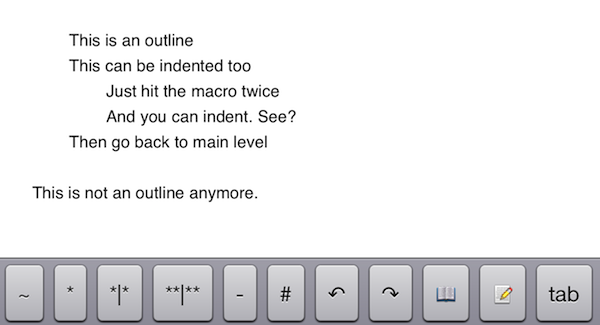 This is how I built the outlines for my Mountain Lion and iOS 6 reviews, and I'm always looking for improvements. As I discovered, OmniOutliner for iPad wants to receive tab-delimited plain text. So, unlike Jeff's, my macro doesn't have hyphens, just a tab that I can hit as many times as I need to indent text into lines and children. Unfortunately, it doesn't seem like tab-delimited plain text can handle notes, but that's something I do in OmniOutliner or CarbonFin Outliner anyway. I would love to see proper documentation for plain text import in OmniOutliner; for instance, while OmniOutliner can export to plain text, if you try to re-import what you exported (I know, I like to reverse-engineer plain text), OmniOutliner will lose indentation. Similarly, I'd like to see import/export options in CarbonFin Outliner, which is still lacking from this standpoint. 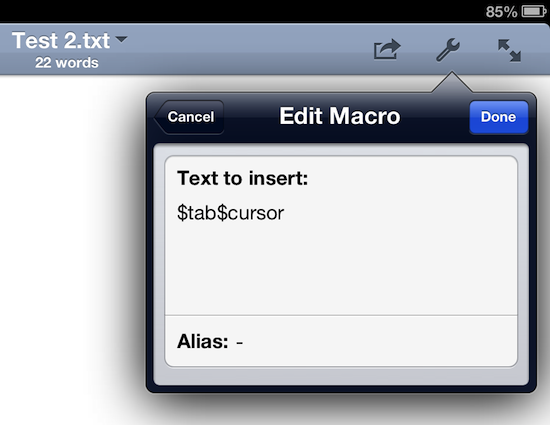 As for Nebulous Notes, the latest 6.0 version lets you chain macros, which makes the app even better. Check out Jeff's plain text workflow for outlines here. 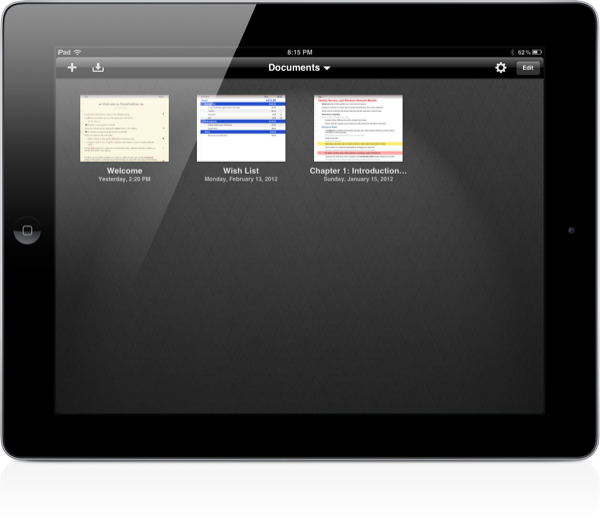 The Omni Group have removed the carousel in OmniOutliner 1.2 for a new document browser that closely resembles Pages’. Giving a broader overview of your outlines, the new file browser makes it much easier to scroll through dozens of documents without having to individually file past each one. The new file browser doesn’t let you create folders or sync to the cloud, but the original WebDAV and iDisk implementations are still available for online storage. OmniOutliner for the iPad has been getting a lot of love here at MacStories, and we’re really excited about the version 1.1 update that hit the App Store yesterday evening. The first major update to OmniOutliner brings a ton of new feature and usability improvements, including searching for text, pasting multiple paragraphs as separate rows, and being able to split text into a new row if you’re breaking up girlfriends… I mean paragraphs. Let’s take a look at The Omni Group’s latest handiwork after the break.